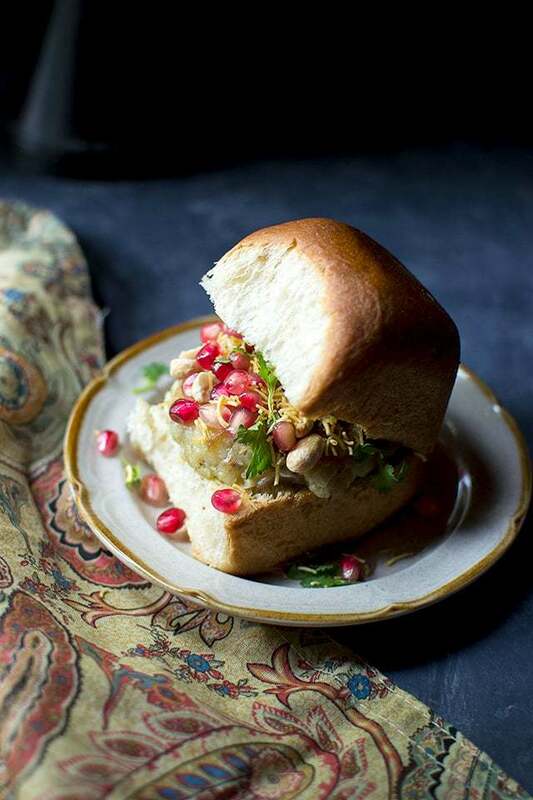 Dabeli is a popular Gujarati street food made with spicy potato filling which is then topped with onion, pomegranate and sev. A very flavorful and addictive sandwich. Dry roast the dabeli masala ingredients in a pan until fragrant. Grind to a fine powder in a spice grinder or blender. Use as needed. Heat oil in a pan, add the cumin seeds and once the seeds start to splutter, add asafoetida, 2tsp ground dabeli masala, mashed potato, salt and some water. Mix well and cook for 4~5 minutes. Take off the heat and add the sweet tamarind chutney and mix well. Set aside. Slice the buns in half horizontally and cook the buns with butter until nicely toasted. Smear green chutney on both sides liberally. Place some of the potato filling on the bottom half of the bun. Top with the onion, peanuts, cilantro, sev, pomegranate, green chutney and sweet tamarind chutney. Sandwich it with the top half of the sandwich bread and Serve! !